Despite having the bank account of, well, an au pair, I always like to riffle through the latest bags and totes, in hopes that I will finally find The One. I know it exists, but for now, I'd like to stick to a three digits. 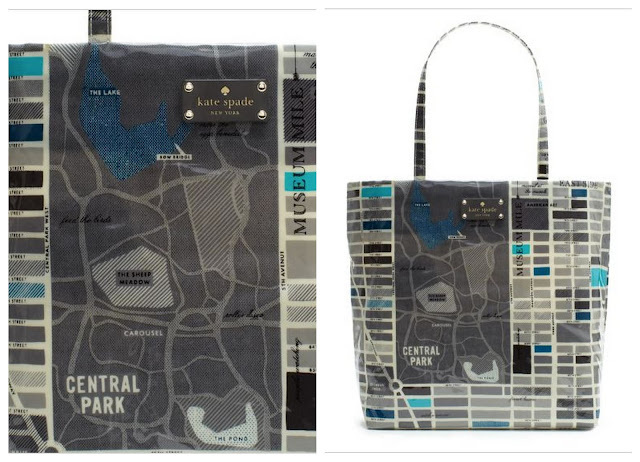 The graphic print of this 'Street of New York' tote grabbed me and won't let go. Of course, I'd prefer if it featured the mean streets of Lights where I currently reside, but the giant central park map and retro-typography make this cute enough to spend a month's metro fare on. If only Kate would considering explore some international cities, I might just have found an interim replacement. If you've got 69-dollars to spend and dig the grey-blue-teal combo as much as I do, consider snagging this before the sale ends!